When Ariel’s friends convince her to go out for a ladies night with them, she doesn’t realize her whole life is about to change. She meets Blake, a handsome enigmatic man hiding a big secret. That’s alright, because she has some secrets of her own she has no intention of sharing. The problems start when the secrets begin to come out and their lives become hopelessly entangled. Their relationship brings Ariel the attention she has hidden from for years and exposes her to an evil she never believed was real. This will be the first of my Paranormal Romance/Suspense series. It will be available, in Ebook only, (tentatively) by June 1st of this year. As a writer, of course I believe in book reviews. Not all readers see the value in them. Why would it help you as a reader to take your time, which most of us agree there is never enough of, to review a book? If you are interested in the quality of the books you read, you should take the time to post a review. Most writers read each and every review that they are aware of. I know I do. I want to be the best writer I can be and I think most writers share this view. If you love something in a book and want to see that or even more of that in future books, say so in a review. Does something irritate you about the writing style of an author you love? Let them know. Maybe it is something they never noticed because no one ever pointed it out. I have been very lucky to get suggestions from my writer’s group and readers who have read my first book. I want to grow and improve and I do make changes because while I do write for myself, I also write for readers. A storyteller with no audience isn’t a storyteller at all. All my giveaways of Planet Amazon the Rebirth are now concluded. Congrats to the winner of the book and to all those who took advantage of the free downloads on Smashwords. Crystal is fresh out of high school and starting college. She is determined to make the most of it, when she gets blindsided by the man of her dreams. She meets him for the first time while on a campus tour. She’s sold on the college when he says, “I hope to see you in the fall.” Crystal fantasizes about her mystery man all summer long and is determined to find him. When she doesn’t see him again she’s surprised when he show’s up at her front door and introduces himself as Gabriel, her roommates boyfriend. Just when she gets to know Gabriel, her best friend, Ryan, swoops in and confesses his love for Crystal. Follow Crystal, Ryan, and Gabriel when they tell their story of love and conflict. Author Bio: Becca Lee Nyx has spent all of her life in the state of Oklahoma. She is a wife to her wonderful husband that she met when she was 8 years old when he moved to the US from England. Becca, is also the mother to two wonderful kids, a boy and a girl ages 5 and 22 months. When Becca isn’t writing, attending to her husband or children, she is crocheting, working out at the gym, cruising the internet, or curled up with a good book. Hi, Becca. It’s so nice to have you with us today. I’m going to jump right in with the questions so I can get you back to your children. Q. You are married to the love of your life and have two small children. With little children at home, how do you manage to concentrate on your writing? I’m glad to be here and I love to share with my fans. I mostly write when my kids are sleeping. My son is currently attending Pre-K, so I write in the morning, before my daughter wakes up, during her nap time, and when both my kids go to sleep for the night. While writing ‘Swept’ I spent many nights writing until 2 or 3 am! The next day I would wake up and do it all over again while chugging energy drinks! It also helps that my husband works the night shift over the weekend, so I’m not very distracted! Q. You named your main character after me! Was it just a name you liked or did you name her after someone you know? I wanted to use a name that was relatable. I pulled up a list of popular names in the 80s and Crystal stood out to me as the perfect name for my main character. Q. I understand your husband is from Britain. Have you ever gone there? Unfortunately I have not. His grandparents live in Exeter and I met them for the first time when they came to visit 7 months after my husband and I got married. We’ve exchanged letters over the years and we’ve told them about my book and they’re very happy for me! We will be visiting in May and I’ve very excited and nervous. I don’t want to come off as the “typical American tourist!” I really can’t wait! Q. How difficult did you find it to get published? I haven’t tried to pitch myself to publishers yet. I’ve looked up how to do it and read all about it, then I researched self-publishing . I read about all the different ways to do it. I’ve wanted to self-publish for at least 5 years, but I’ve never finished a book that I’ve started writing. I started reading a book in January, ‘The 15 Invaluable Laws of Growth’, by John C Maxwell. The book made me ask myself what it is I want to do, why I haven’t done it, and encouraged me to go ahead and pursue my dream even if I fail doing it. The only thing I can stand to lose is time and I will gain more out of the process that I can put towards my next attempt. People fail all the time and it’s okay to fail, it’s the only way we learn and grow. So, starting January 31st, I began putting my time into writing just to see where it would take me. I wanted to prove to myself that I could do it and look where I am now! Q.What made you pick the genre you did? I’ve noticed that ever since ’50 Shades of Grey’, has gone mainstream that the romance genre has really taken off. People like to read it. So, I figured, “Why not?” I found that it is just a little easier to write about a world that exists, than a world that I’ve made up in my imagination. For a first attempt I wanted to stay with something that would, “challenge” me as a writer, but not be too challenging. Q. Do you have anything that helps you write, like music or a shot of vodka? Quiet, with few distractions; I write best when my children aren’t awake to distract me. Caffeine has also been a great help! Unfortunately, it’s hard breaking the addiction of energy drinks! Q. Any advice to those thinking about writing a book? Get something written. It can be on paper, on the computer, scribbled on napkins, or on your phone, but write. Write what you know, write what you think, feel, see, touch, and smell. Get words on paper even if you feel like your writing is complete crap! Keep going until you get to the bitter bloody end! I nearly gave up multiple times while writing Swept. I started with Crystal’s point of view and wrote until I finished. I was at 23,500 words and 69 pages. I went back and edited my work and added 1,000 words. During the 3rd edit of the book, I sent an e-mail to my friend ranting and raving about one of the characters. At the time I had no idea who he was, what he was doing or even why he was important other than the fact he was ‘hot.’ My friend worked with me and by the end (20 something e-mails) I finally had direction and knew what I was going to do with my story and characters! I stared over and added in new perspectives and finished my third draft with 45,545 words and 176 pages. I felt that I finally had a story worth reading. The important thing is, I didn’t give up and I pushed myself. You won’t get anywhere if you don’t do those two things! Q. Any website that you find particularly helpful? I’ve followed Author, Darren Shan, for years now. He is a YA horror author. I picked up his books for the first time 9 years ago. I follow his tweets and blog. He has a lot of great advice when it comes to writing and even has a mini book posted on his website on how to write. His main piece of advice is the same thing I’ve already said. If you want to be an author, the first step is to keep writing and not stop until you’ve reached the end. Q. How do you like being a published author? Considering I’m self-published, I’m finding a whole new world and I’m learning how to connect with my readers. I’m usually shy and don’t put myself out there, so now I have to come out of my shell and really talk to people. I’m always self-conscious and worried that no one is going to like me, and I’m worried about negative attention. I really want people to like me and my book, but I know not everyone will and I’ve come to accept that. Each and every person is entitled to feel how they want to feel, even if that means they don’t like me or my book. It’s just something I’ll have to deal with and get over and that’s okay. Q. Anything you want to share with your fans? I hope you all really enjoy ‘Swept’! I’ve done the best I can to really make the characters come alive and seem relatable. Also, if you like my book don’t hesitate to rate it on Amazon or Goodreads, and you can message me or e-mail me anytime! I’m never too busy to talk to you all! Becca’s book ‘Swept’ is available on Amazon Kindle and it is smoking HOT! Having lost her mother and brother, Stella stands on the roof of her building, about to jump. She is stopped by a handsome young man, who jumps first. Somehow, he survives and Stella soon discovers that Conner holds a dark secret and more than a passing connection to her own unhappiness. But Conner isn’t the only man to take an interest in Stella. Will is dangerous. He has mood swings, a crazy older brother and the ability to heal abnormally quickly. Stella knows what Conner is, but what exactly is Will – and why does he appear to know more about Conner than she does? Hello Jess, glad you could join me today. Did you see Ariel on the way in? I am interviewing her for my new book and she’s not been a werewolf long so you can’t be too careful. But you know a lot about the paranormal, so I don’t have to explain anything to you. Hello, Crystal. I thought I smelled a werewolf, but I didn’t see her. I’ll just start with some questions so your fans can get to know you better. Q. What made you decide to write a paranormal book ? Paranormal is one of my favourite genres so I thought I would give writing a paranormal book a go and see what I could come up with. Q. What is the most difficult thing about publishing a book? I would say it’s trying to make your work stand out, especially when you don’t have a literary agent. You’ve got to capture the readers’ interest which is hard when there are so many good books around. Q.What experience or education was the most helpful when you started writing your book? One of my English teachers once said to me “You’re not much of a writing person are you?” which made want to prove her wrong and encouraged me to write. Also moving half way around the world helped me see things from other people’s perspectives. Q. What has been your overall experience when dealing with other authors? I’ve found other authors to be very helpful and encouraging. I’m on several writing websites and the members are always supportive and offer advice. Q. Is there a website or writers group that you found particularly helpful to your writing? Jottify is probably the website where I get the most feedback from other authors. It’s hard to be critical of your own work so having other people willing to help is brilliant. Q. Is there a type of music or something else that helps you write when you get stressed out or have a bad day? I always find that listening to a bit of Paranormalmore or Evanescence cheers me up and gets the creative juices flowing. Q. How long did it take to write your book? It took me around six months to write the first draft and then a month or so to edit it. Q. Have you found family and friends to be supportive and if so, how? My family and friends have been very supportive, though surprised as I didn’t tell anyone that I was even writing a book. They’ve all been buying my book and recommending it to their friends. Q. Are you working on another book? Will it continue a series? 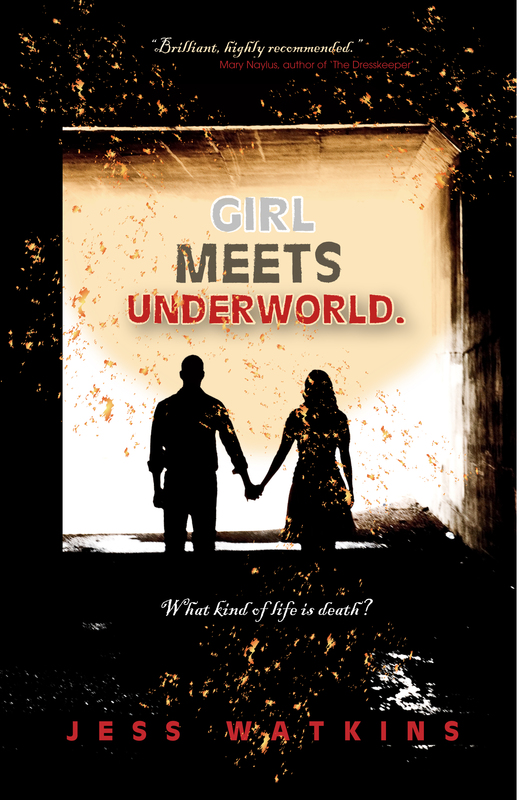 I’ve got several books in the works but at the top of the list is the sequel to Girl Meets Underworld. I’m only planning on writing one more book about Stella but you never know, I may end up doing more. Q. Is there anything you would like to share with other authors or your fans? Never give up on your dreams. Don’t let people tell you what you can or can’t do. Thank you, Jess for sharing with us and maybe we’ll see you again when the next book comes out. Jess Watkins is currently in her final year of university studying a Masters in Chemistry. She has lived in three different countries and owns an unreasonable number of t-shirts. A Whovian, Browncoat and Sherlockian, Jess loves fantasy and sci-fi as well as animals, reading and skiing, and of course writing. Planet Amazon the Rebirth Part 2 is now available on smashwords.com for 1.99. It is the second half of the original book. Happy reading! A copy of Planet Amazon the Rebirth Part 1 is available for free on Smashwords.com for a limited time. This is an ebook only version and is half the original book. Happy reading!